I was a big fan of the comics page as a kid. However, Garfield becomes less and less funny as I grow older, and the double blow of losing both The Far Side and Calvin and Hobbes around the same time meant that newspaper comics have been sapped of much of their former strength. Many of the old stalwarts still remain - I find Hägar the Horrible pretty funny, no matter what anybody says - but Blondie, Beetle Bailey and Hi and Lois have lost whatever wit they might have once had. Others, like Shoe, Peanuts and B.C., continue on despite the death of their creator, a perverse legacy that takes three strips that once made me laugh and now either publishes reruns or write new jokes to old pictures. As of this week, the comic Doonesbury is forty years old. This is not so surpring in and of itself - the comics are a medium in which initial publication seems to guarantee that the strip will never die. But what is surprising is that the strip still manages to be fresh, funny, and relevant four decades into its run. It's still written and drawn by the original creator, and it still manages to paint characters who haven't devolved into stereotypical comic foils. It's one of the few bright spots on an otherwise dull and outdated comics page. 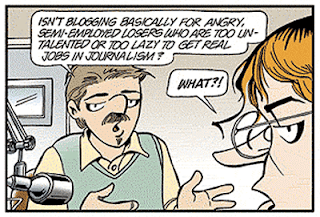 I read Doonesbury every morning. If I'm running late, it's the only part of the paper I read before taking off to work, forgoing news, editorials, weather, sports scores and other comics. But I haven't always been a fan. As a child, the text-heavy strip befuddled me. Who were all these characters who looked sort of the same? Why was there no slapstick humor? What's with all the Grown-Up themes? It was like For Better or For Worse, only worse, because it had no children in it. Doonesbury seemed to be just a bunch of adults standing around and talking. The strip is famous, even infamous, for being political. But, unlike editorial cartoonists, Trudeau deftly mixes his politics with his character-driven storylines. In the past month, the strip has satirized California's Proposition 19 through the hippie Zonker, lampooned Hamid Karzei through a student working as a CIA intern in Afghanistan, and taken jabs at the Tea Party through Mark Slackmeyer, the gay talk radio host. Yet Trudeau can utilize traditional political cartooning just as well as the rest; he notedly used a feather for Dan Quayle, a waffle for Bill Clinton, and a cowboy hat for George W. Bush (which turned into a Roman imperial helmet after the war in Iraq). Doonesbury's exterior shots of the White House as the President talks used to annoy me, but as I grow older, I find they often contain of the strip's best and most political humor; Trudeau is one of the few humorists who's managed to make fun of Obama, and his strips about Nixon won him the Pulitzer Prize in 1974. But above all the political humor, the strip's greatest asset is its characters. It's humor is character-based, but not the cheap humor of something like Garfield; I can easily name a dozen characters in the cast who are all real people, as believable as any characters from a novel. Their lives change and they grow older; one of the delights of reading the older strips from the 70s in book form is tracing the evolution of these people from idealistic hippies to jaded middle-aged baby boomers with a whole new set of problems. Doonesbury's large cast makes it difficult for newcomers to completely understand what was going on (I've been reading for ten years and sometimes I still get confused at relationships between the cast). The broad cast of characters ensures that the strip has a character from every walk of American life - politicans, scholars, businessmen, soldiers, students, pot-smoking hippies, trailer trash, and everything in between. The varied assortment of characters often makes the easy, cheap jokes difficult, but it makes the deeper, more emotional forms of humor that much more effective. The strip has had many memorable moments over the years (Slate is currently running a retrospective highlighting many of them), but the one that sticks in my mind the most is a storyline from 2004. This week centered around B.D., a character who started out as the stereotypical conservative jock, but had grown into a far more nuanced and interesting person. B.D. had fought in Vietnam and the first Gulf War, later worked as a football coach, and for over thirty years had never been drawn without wearing a helmet. In 2004, B.D. returned to Iraq to fight in the Second Gulf War, and was in a convoy that got attacked by insurgents. As the strip went on, the reader could follow the action from B.D. 's point of view as he was rescued by his comrades and taken to a doctor. One day, the final panel zoomed out to show B.D. lying on a surgical table. The initial shock is that we see him without a helmet for the first time in the strip's history - is that really B.D.? With hair? It was so shocking that it took me a moment to realize that B.D. 's leg had been amputated. This remains the single most startling thing I have ever read in the comics section - a character who I had followed for years unexpectedly suffering a very real tragedy. It launched into a gut-wrenching storyline that features some of Trudeau's best work. In the six years since the amputation, B.D. has struggled with post-traumatic stress and alcoholism after his return from Iraq. In the hands of a lesser artist, this sort of plot could be opportunistic, exploitative or kitschy. But Trudeau somehow has managed to tackle the Iraq War with both gravity and humor, managing to make jokes while never being offensive. It's a fine line to straddle, but Trudeau has pulled it off. He has donated profits from the book with this strip to wounded veterans, and received the US Army's Command Award for Public Service for the money and attention he's raised. The concept of the "Great American Novel" has been tossed around from time to time in this country - the ambitious idea that there can be one work of art that sums up what it means to be an "American," representing all classes and demographics in this bewilderingly huge country. The search for such a novel has gone on for years, but really it's been on our comics page the whole time. Looking back through older Doonesbury strips this week, its incredible to follow these characters through the booms and busts of American history. From Nixon to Obama, Trudeau has portrayed it all with wit and wisdom. His characters have been growing and maturing and trying to make sense of what's going on in this country since 1970. They still haven't found any sanity, but it's nice to be able to open the newspaper and read about some old friends dealing with the same issues that you do. Through its longetivity, its large cast, its vast array of plot arcs and subjects of satire, Doonesbury is the great American novel, somehow incorporating the political elite and the hoi polloi all into four tiny panels a day. Just because its printed on recyclable newspaper doesn't mean the strip is disposable. If anything, it's one of the few newspaper comics that deserves to be remembered.